NEW DELHI: Prime Minister Narendra Modi has given his full support to push electronics manufacturing, which needs lots of incentives and duty restructuring, Telecom and IT Minister Ravi Shankar Prasad said today. "We can give jobs to 2 crore 80 lakh people if we push electronics manufacturing in a big way that requires lots of incentives, duty restructuring, other things. "Because budget is coming I cannot tell you anything, except to say that the PM was all ears and he has given me full support to push electronics manufacturing in a big way," he told reporters at an interaction with journalists at Indian Women's Press Corps office. The minister said he has cleared setting up of eight electronics manufacturing clusters (EMC) since he took charge of the Ministry in May. Under the EMC scheme, the government provides financial support for building industrial parks that house eco-system for manufacturing of electronics products. An electronics manufacturing project can also get benefit under modified special incentive package. "India imports electronic goods worth $100 billion every year which is likely to become $400 billion by 2020. The (electronics) import bill may surpass fuel oil import bill," Prasad said. Till date, the government has notified 50 brownfield electronics manufacturing clusters and has given in-principle approvals to seven greenfield EMCs across 13 states and a Union territory. The electronics industry has identified present duty structure as major roadblock. According to industry body ELCINA, a special policy package is required for high value-added manufacturing. "High domestic taxes and anomalies therein cause fiscal disabilities with very high indirect taxes. A 12 per cent GST across the board should be made applicable for electronics value chain," ELCINA Secretary General Rajoo Goel had said in the industry's budget wish-list. 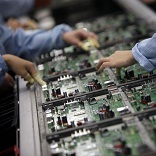 The electronics industry has unanimously raised the need for providing low-cost financing to manufacturers, especially of those products and items allowed to be imported duty free under a WTO agreement. The Assocition sought deemed export status for the electronic and semiconductor sector to address disabilities and have preference for local value added manufactured products. Prasad said that Prime Minister Narendra Modi has spent 2.5 hours on presentation given by the Department of Electronics and IT, 2 hours on telecom and 1.5 hours on the Department of Post to understand issues.